American White Pelicans. Photograph courtesy U. S. Fish and Wildlife Service. Chase Lake National Wildlife Refuge north of Medina, North Dakota, has been the home of nearly 30,000 American White Pelicans for the past two years. An estimated 29,000 have disappeared as of May 28, 2004. 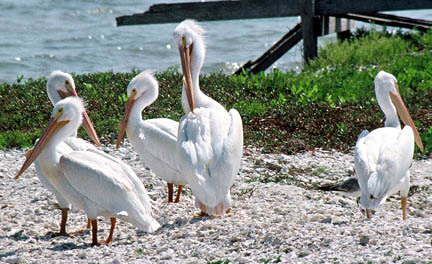 June 29, 2004 Bismarck, North Dakota – The Bismarck, North Dakota office of the U. S. Fish and Wildlife Service began hearing that American White Pelicans were disappearing from the Chase Lake National Wildlife Refuge north of Medina, North Dakota on May 28, 2004. Two and a half weeks later, 29,000 pelicans had disappeared without a trace. See 06/17/04 Earthfiles. Four of the 29,000 pelicans had previously been wired with radio transmitters for migration research from satellites. Today I talked with Ken Torkelson, writer-editor, and spokesperson for the U. S. Fish and Wildlife Service, Bismarck, North Dakota, about what the satellite reported from those four American White Pelicans. Interview: Ken Torkelson, Writer-editor-spokesperson, U. S. Fish and Wildlife Service, Bismarck, North Dakota: “Bird Number 36069 took a very circuitous route from Chase Lake. It left on June 2, 2004, and headed almost straight south to the South Dakota border. Then it went a little ways west and back up west/northwest crossing the Missouri border south of Bismarck and headed further northwest. Then it made a little correction to go west and spent a couple of days out there. Then headed back kind of to the southeast across the South Dakota line. Then went back west again, almost paralleling the border and spent a couple of days in northwestern South Dakota. Then the bird headed back east/southeast a little bit and made a correction and sent straight south, eventually ending up on June 15 west and a little bit north of Pierre. That was the last satellite reading we had on that one. Bird No. 36070 went pretty much straight south to the South Dakota border taking a couple of days to get there. Then it made a big turn to the east/southeast, crossing the border and our last reading showed the bird at probably Lake Traverse which is where the two Dakotas and Minnesota come together. The third bird, No. 36071 is the most interesting of the bunch. It headed straight south and went into south Dakota maybe 30 or 40 miles and spent a week there. Then, it started coming back north and crossed the border into North Dakota over the span of a couple of days. then it made a correction and headed northwest, passing within several miles of Chase Lake National Wildlife Refuge where it originally came from before heading further northwest and ending up near Harvey, North Dakota, which is basically north and a little bit west of Chase Lake. That was the last reading for that bird on June 14, 2004. Then bird No. 36072 knew exactly where it was going and headed there immediately to the South Dakota border, straight south of Chase Lake and stayed there until at least the last satellite reading on June 18, 2004. THESE WERE THE ONLY FOUR BIRDS THAT WERE RADIO MONITORED AND COULD BE TRACKED BY SATELLITE OUT OF THE ESTIMATED 30,000 THAT DISAPPEARED? Exactly. But we believe the other pelicans have scattered much like these four scattered. We have now had reports of increased pelican numbers at Tamarac National Wildlife Refuge which is about 50 miles into Minnesota from the North Dakota line. And we have had increased numbers on the Missouri River, we’ve had increased numbers up in the Turtle Mountains along the North Dakota/Canada borders of central North Dakota. Interestingly enough, we’ve had reports of increased numbers of pelicans on the Yellowstone River between Sydney, Montana and Williston, North Dakota. Normally that is not pelican country. We’ve also had citizen reports of pelicans on Lake Chida which is west of Bismarck and south 80 miles. DOES ANYBODY YET HAVE A HYPOTHESIS ABOUT WHY NEARLY 30,000 BIRDS WOULD TAKE OFF LIKE THIS AND GO SOME IN A CIRCUITOUS ROUTE AND SOME ENDING UP IN A WYOMING SITE WHERE THEY’VE NEVER BEEN BEFORE? A lack of credible hypotheses is the problem. Were Birds Running Out of Food At Chase Lake? BUT THE BOTTOM LINE IS THAT NO ONE KNOWS WHAT SCATTERED 30,000 BIRDS IN THE FIRST PLACE? You’d be correct in saying that. We have one interesting theory right now and that is the cold, wet spring at their nesting ground placed increased stress on them and the adult birds realized they might not be able to survive in those conditions and left to find some place they could survive. That theory also includes speculation that the additional rains we’ve had might have made it more difficult for the pelicans to get at their food source. They are shallow water feeders and if a combination of increased water levels and colder temperatures drove their food base into deeper water, there is going to be the same amount of food there. It’s just they can’t get at it. SO YOU’VE HAD A LOT MORE RAIN THAN NORMAL? And I’m not sure it was the rain as much as the cold temperatures, although they have had quite a bit of rain in that Chase Lake area. BUT ISN’T IT STILL BAFFLING THAT NONE OF THEM CAME BACK? It’s, yeah, I guess it is. But you know, once they figured there wasn’t enough food there to support them, why go back? Especially if they found a place with enough food to support them. WOULDN’T YOU HAVE THOUGHT THAT SOMEBODY SOMEWHERE WOULD HAVE NOTICED A GIGANTIC FLOCK OF PELICANS FLYING IN THE AIR? I don’t think there is ­ and maybe there was not ­ a giant flock of pelicans in the air. I don’t think they took off en masse. I believe there was a gradual departure ­ meaning maybe they took off in flights an hour apart. RIGHT NOW, WHAT DO YOU THINK THE PROGNOSIS IS FOR THE FUTURE OF ALL THOSE BIRDS THAT ARE SCATTERED? IF ANYONE HAS INFORMATION, WHO SHOULD THEY CONTACT? Chase Lake National Wildlife Refuge at 701-752-4218.